Many Arduino projects may need more than two voltage supplies. When fed with 4.5-35V, this power shield is able to provide a voltage range from 1.25-12V with 3A peak current. Ideal for servo control and other non-standard components. With this shield, your Arduino can now have one power supply for everything. 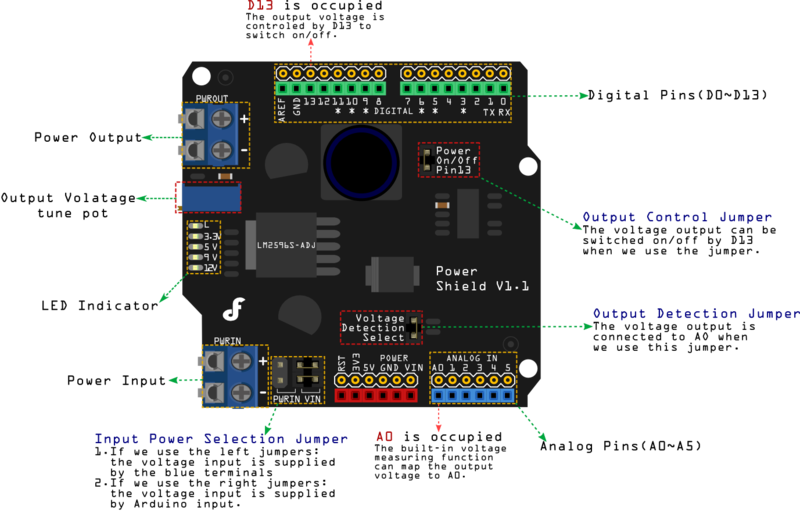 The power shield has a built-in voltage measuring function which maps the output voltage to Arduino analog pin 0. It can be controlled by Arduino digital Pin 13 to switch on/off. Stack up more power shield to add up different power level outputs. If your Power supply is incompatible with your device and you need to provide power for other devices as well. Adding another power shield will let you regulate a secondary voltage level as well. This sample code needs an I2C LCD module to display the voltage. NOTE: If you have a multimeter, you can easily read the output voltage through output terminal without the LCD and LCD displaying code. In other words, voltage regulation is independent. Consider it as a normal shield with function of voltage regulation. LCD will display the output voltage from the Power shield. 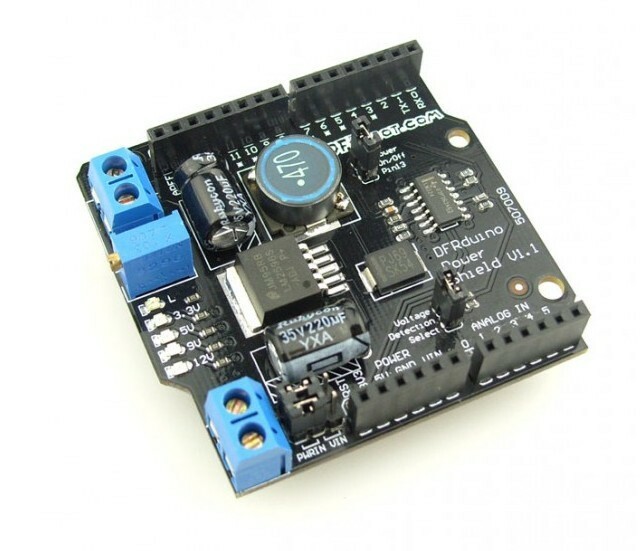 Get it from Power Shield (Arduino Compatible) or DFRobot Distributor.